Summer is on its way and with that comes a schedule jam packed with play dates, summer camp, and road trips. With all these activities planned, there is one thing your kids are sure to need … great tasting snacks! 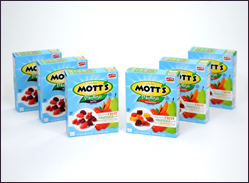 Fortunately the Mott’s® taste that kids love is now available in yummy fruit flavored snacks! Available in Assorted Fruit and Berry varieties, Mott’s® Medleys Fruit Flavored Snacks are the ideal blend of great tasting and quality ingredients that will make both kids and moms happy. Mott’s® Medleys Fruit Flavored Snacks are great on-the-go, so whether your family is lounging by the pool, playing in the park, or hanging on the beach this summer, Mott’s® has snack time covered! Visit http://bit.ly/MottsCoupon to download a printable coupon for $0.60 off the purchase of (1) Mott’s® Medleys Fruit Flavored Snacks today! Disclosure: The product and information have all been provided by Mott’s® through MyBlogSpark. I guess these are good if you like ingesting mineral oil and carnauba wax.